The functioning of the autonomic nervous system has to be seen in the context of behavior, i.e. 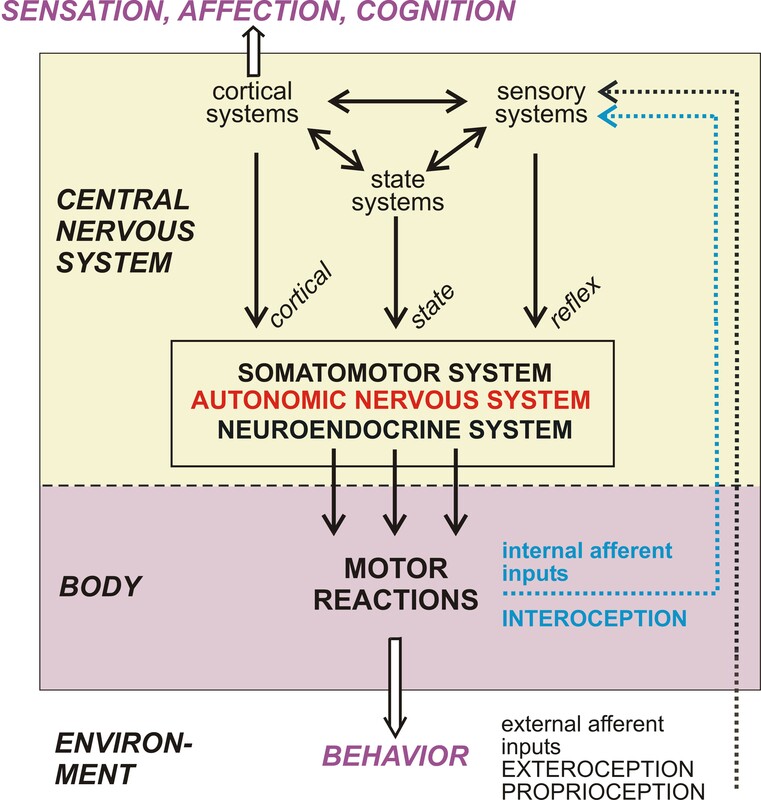 in the context of the somatomotor system, the neuroendocrine systems and the exteroceptive as well as interoceptive sensory systems. Functional organization of the nervous system to generate behavior. The motor system, consisting of the somatomotor, the autonomic (visceromotor) and the neuroendocrine system, controls behavior. It is hierarchically organized in spinal cord, brain stem and hypothalamus and receives three global types of synaptic input: (a) From the sensory systems monitoring processes in the body or in the environment to all levels of the motor system generating reflex behavior (reflex). (b) From the cerebral hemispheres responsible for cortical control of the behavior (cortical) based on neural processes related to cognitive and affective-emotional processes. (c) From the behavioral state system controlling attention, arousal, sleep/wakefulness, circadian timing etc. (state). The three general input systems communicate bidirectionally with each other (upper part of the figure). Integral components of behavior are sensations, affective-motivational processes and cognitive processes which are dependent on cortical activity. From Jänig The autonomic nervous system (2013) ref. 27 under teaching. The research on the organization of the sympathetic nervous system in the periphery of the body and in the central nervous system, using neurophysiological, anatomical and other techniques, was one main research topic of the laboratory over the last 35 years. This systematic experimental work resulted into a general concept about the cellular organization and integrative functioning of the sympathetic nervous system. The essence of this concept is that this autonomic nervous system shows high anatomical and functional specificity, in its peripheral pathways and central circuits, with respect to the different types of autonomic target cells. This high specificity is the basis of all autonomic regulations (regulation of the cardiovascular system, body core temperature, gastrointestinal tract, pelvic evacuative organs, reproduction, protection of body tissues etc.). The collaborative work with Prof. Elspeth McLachlan (Sydney) and Prof. Robin McAllen (Melbourne) concentrated on this research interest. Reciprocal communication between brain and body tissues by efferent autonomic pathways and afferent pathways. The global autonomic centers in spinal cord, lower and upper brain and hypothalamus are shaded in violet. These centers consist of the neural circuits that are at the base of the homeostatic autonomic regulations and their co-ordination with the regulation of the neuroendocrine systems, the somatomotor systems and the sensory systems establishing behavior. The brain sends efferent commands to the peripheral target tissues through the peripheral autonomic pathways (red). The afferent pathways consist of groups of afferent neurons with unmyelinated or small diameter myelinated fibers (blue). These afferent neurons monitor the mechanical, thermal, chemical and metabolic states of the body tissues. From Jänig The autonomic nervous system (2013) ref. 27 under teaching. 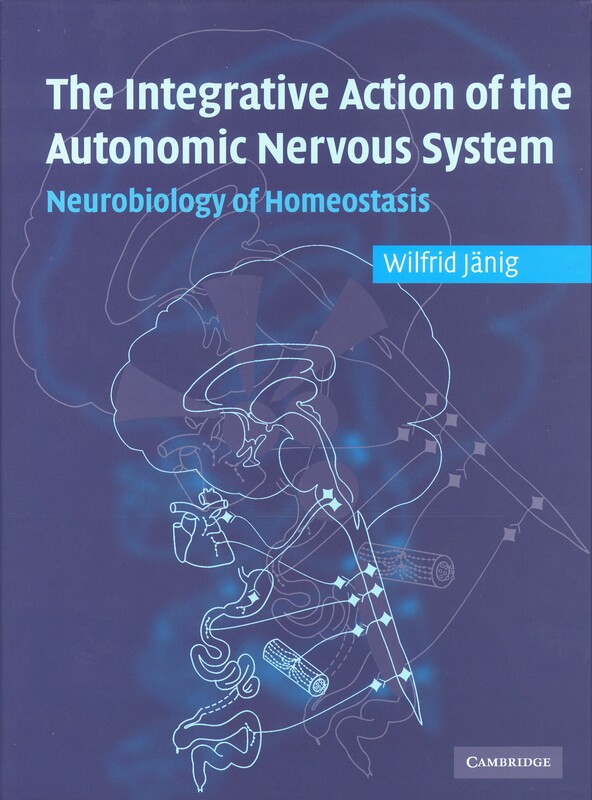 The Integrative Action of the Autonomic Nervous System. Neurobiology of Homeostasis. 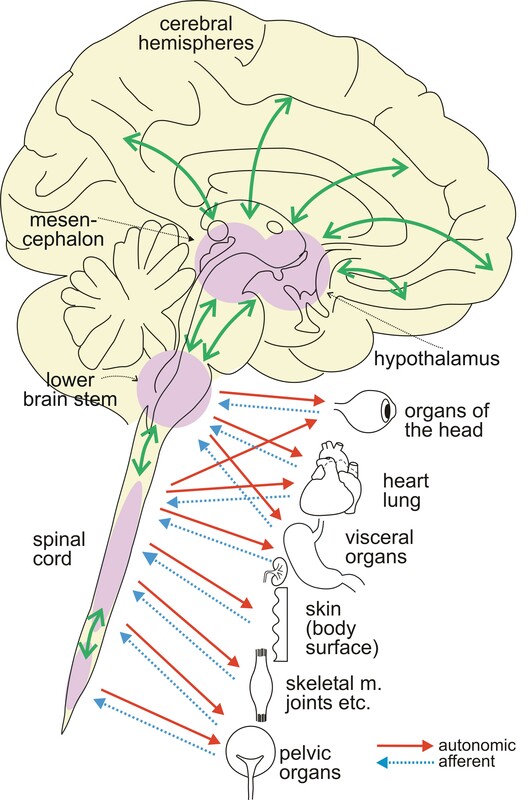 which describes the neurobiology of the autonomic nervous system in the periphery of the body as well as in the central nervous system (see Introduction of the book, Link to Cambridge University Press). A. We have shown, in the rat, that vasoconstrictor pathways to skeletal muscle and skin are connected to in the spinal cord to very distinct inhibitory reflex circuits activated by nociceptive afferent neurons. Thus, activation of nociceptors in skeletal muscle or skin, e.g. by tissue injury, leads to increase of blood flow through skeletal muscle or skin via these spinal inhibitory reflex pathways. This neural mechanism of increasing blood flow through tissues furthers healing of injured tissues. 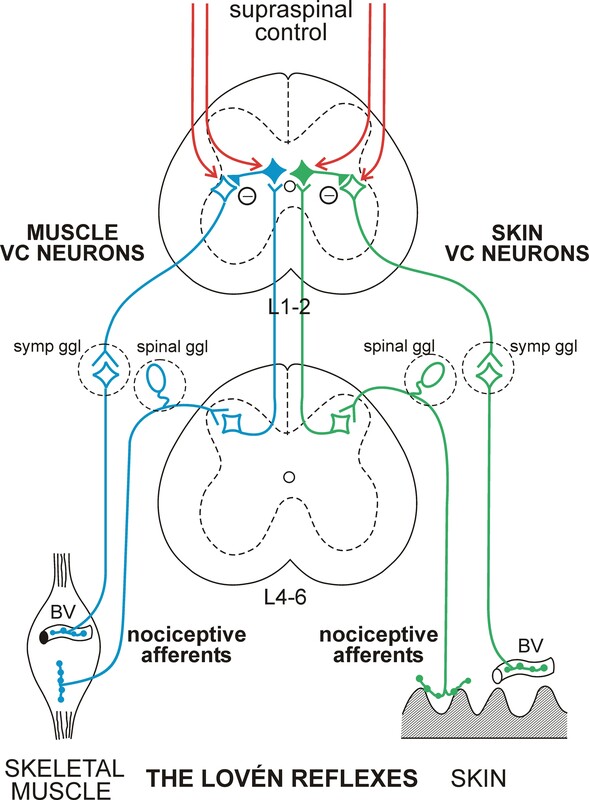 Organization of the inhibitory nociceptive reflexes of the cutaneous vasoconstrictor (CVC) system (right, green) and of the muscle vasoconstrictor (MVC) system (left, blue): A hypothesis. Shown are transverse sections through the lumbar spinal cord L4-6 and L1-2. Nociceptive afferent neurons from skeletal muscle or skin of the rat hindlimb form synapses with second-order neurons in lamina I of L4-6 that project to L1-2. Stimulation of muscle nociceptive afferent neurons leads to inhibition of MVC neurons but not of CVC neurons. Stimulation of cutaneous nociceptive afferent neurons leads to inhibition of CVC neurons but not of MVC neurons. The inhibitory reflexes are organized at the level of the spinal cord, the inhibitory interneurons being possibly located in the same segments as the peganglionic neurons. The nociceptive inhibitory reflex systems to the CVC and the MVC pathway are separated. They are largely lateralized and under differential supraspinal control (red). BV, blood vessel. These inhibitory reflexes are also called Lovén Reflexes. From Kirillova-Woytke et al (2014). The Science and Clinical Application of Manual Medicine. 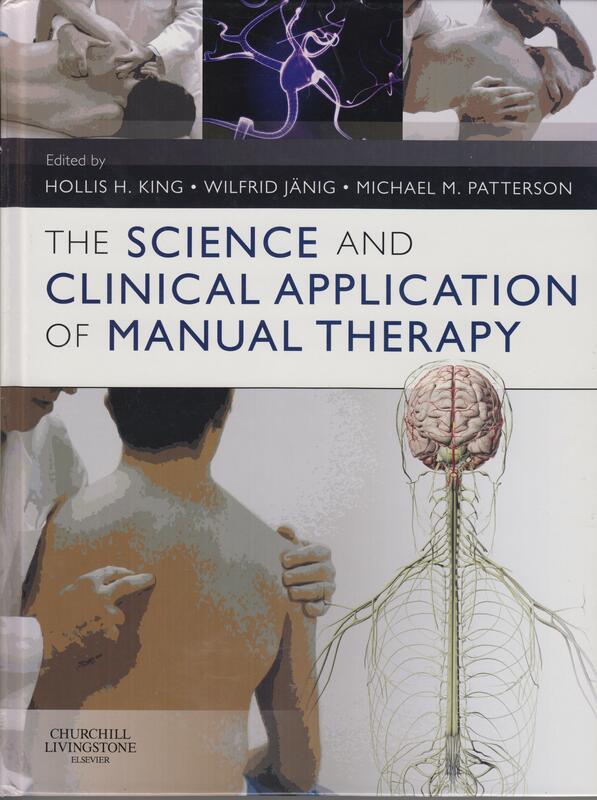 This book discusses the putative neurobiological basis underlying therapeutic manual interventions to treat functional diseases related to the musculo-skeletal system and visceral organs. 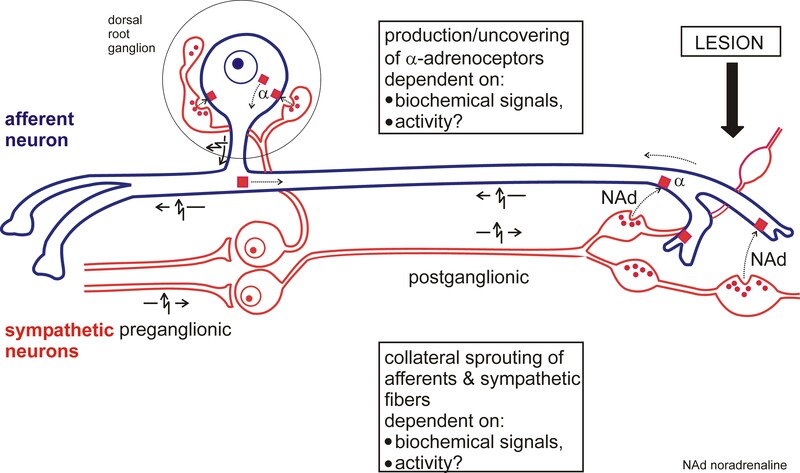 Bratton, B., Davies, P., Jänig, W., McAllen, R. Ganglionic transmission in a vasomotor pathway studied in vivo. J Physiol 588, 1647-1659 (2010). The topic peripheral mechanisms of visceral pain came into focus of the laboratory in the 1980s, in relation to the experimental work on the sympathetic nervous system (see Research Interest I). The laboratory concentrated on the question: What are the functionally characteristics of visceral nociceptors? This experimental work focusing then particularly on viscero-sympathetic reflexes. Mechanical, metabolic or viral lesion of peripheral nerves may be followed by neuropathic pain. 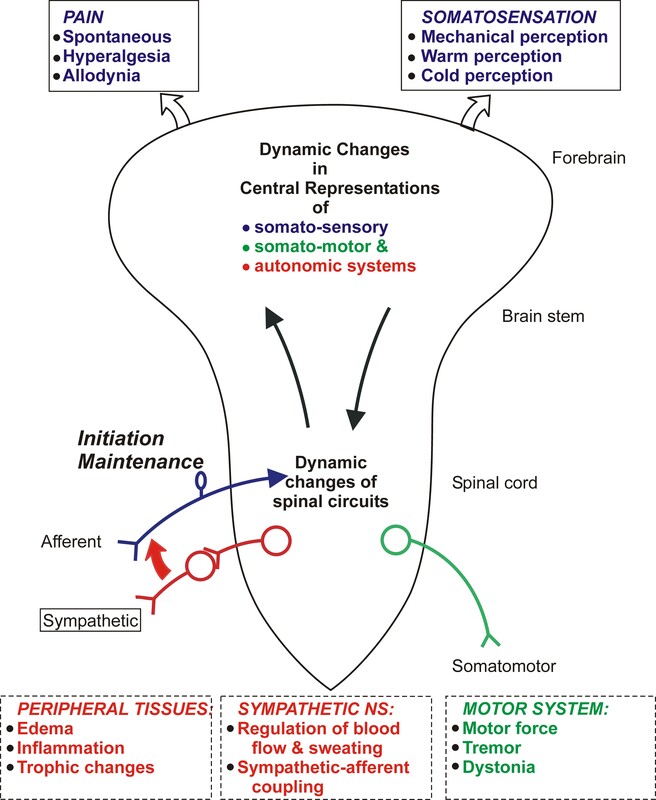 This pain is the consequence of dramatic plastic changes of the primary afferent neurons and secondary plastic changes in the central representation of the somatosensory systems leading to changed somatic sensations (including pain), reflexes and regulations. The laboratory concentrates on the functional changes, that occur in primary afferent neurons with myelinated or unmyelinated nerve fibers following nerve lesion, using neurophysiological techniques in vivo. Unraveling the peripheral mechanisms of neuropathic pain should lead to the design of molecular interventions that prevent the central and peripheral plastic changes to become irreversible with time and should lead to better treatment strategies of neuropathic pain. This research is conducted in collaboration with Prof. Ralf Baron (Department of Neurology, University of Kiel). 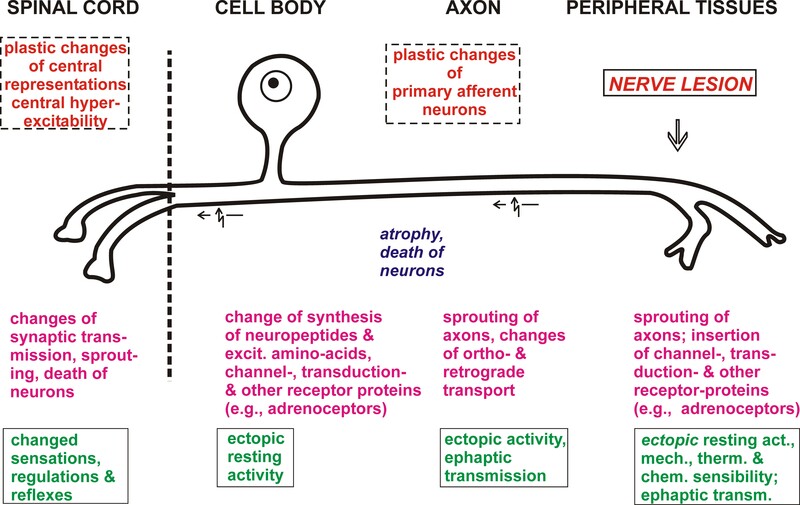 Biochemical, anatomical and physiological changes of lesioned primary afferent neurons following nerve lesion and the subsequent central changes.The most dramatic changes occur in afferent neurons with unmyelinated fibers. Grossmann, L.., Gorodetskaya, N., Teliban, A., Baron, R., Jänig W. Cutaneous afferent C-fibers regenerating along the distal stump after crush lesion show two types of cold-sensitivity. Eur. J. Pain 13:682-690 (2009). Teliban, A., Bartsch, F., Struck, M., Baron, R., Jänig, W. Axonal thermo- and mechanosensitivity of cutaneous afferent neurons. Eur. J. Neurosci 33, 110-118 (2011). Kirillova, I., Rausch, V.H., Tode, J., Baron, R., Jänig, W. Mechano- and thermosensitivity of injured muscle afferents. J. Neurophysiol. 105, 2058-2073 (2011). Teliban, A., Bartsch, F., Struck, M., Baron, R., Jänig, W. Responses of intact and injured sural nerve fibers to cooling and menthol. J Neurophysiol. 111, 2071-2083 (2014). The (efferent) sympathetic nervous system may be involved, under pathophysiological conditions such as pain states following trauma with and without nerve lesion, in the generation of pain and other changes associated with the pain (see Research Interest VI). Pain depending on the activity in the sympathetic neurons is called sympathetically maintained pain (SMP). Research on the mechanisms underlying the coupling between sympathetic postganglionic neurons and afferent neurons under pathophysiological conditions was motivated by the clinical observations on patients with SMP and came into focus of the laboratory in the beginning of the 1980s. Over the years the laboratory made some important contributions to solve this enigmatic problem. Some of this research was conducted together with Prof. Marshall Devor (Jerusalem) and Prof. Elspeth McLachlan (Sydney). Inflammation and sensitization of nociceptors (with subsequent hyperalgesia) following tissue lesions are reactions to protect the body against the invasion of bacteria and toxic substances and to further healing and recuperation. Both peripheral processes involve the immune system, the sympathetic nervous system and the hypothalamo-pituitary adrenal (HPA) system. 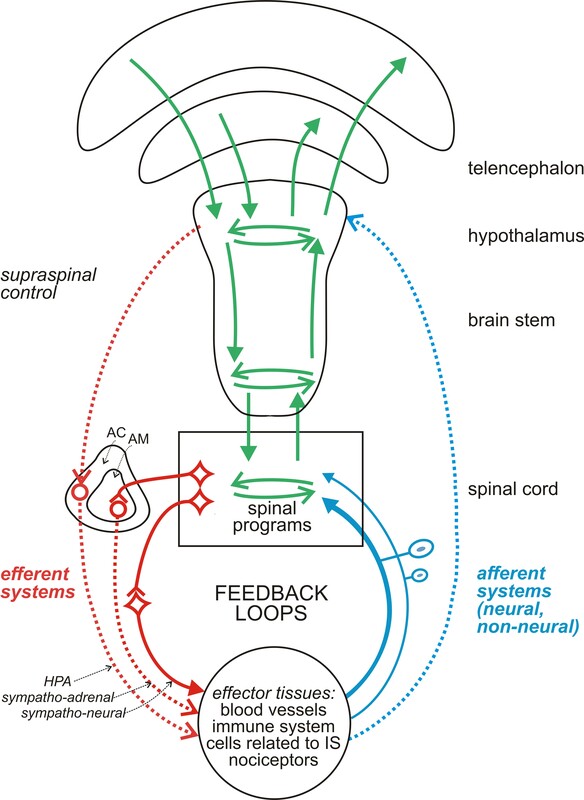 Scheme for the feedback loops between spinal cord and brain stem on one side and the effector tissues involved in protective body reactions on the other side. Effector tissues (blood vessels, immune tissue, cells related to the immune system [IS], nociceptors) are modulated by the sympatho-neural, the sympatho-adrenal and the hypothalamo-pituitary-adrenal (HPA) systems. Function of the effector tissues are signaled by afferent neurons with unmyelinated (C-) or small-diameter myelinated (Aδ-) fibers and by signals from the immune system (endocrine/humoral signals) to spinal cord, brain stem and hypothalamus. The spinal neuronal circuits (“spinal programs”) are under supraspinal control (brain stem, hypothalamus). AC, adrenal cortex; AM, adrenal medulla. From Jänig & Green (2014). Using experimental animal models of inflammation and mechanical hyperalgesia it has been shown that inflammation and sensitization of nociceptors are under the control of the brain via the sympathetic and the HPA system. Feedback from the peripheral inflamed tissue occurs via the nociceptive primary afferent neurons and signals from the immune system (cytokines). These findings argue that the brain is principally able to modulate inflammation and nociceptor sensitivity and to further healing and recuperation. These ideas, based on animal experimentation at the University of California San Francisco, have been developed by Wilfrid Jänig with Prof. Jon Levine. Based on clinical observations and animal experimentation Ralf Baron (Prof. of Neurology, Kiel) and Wilfrid Jänig developed the idea and formulated the concept that the complex regional pain syndrome (CRPS) is a disease of the central nervous system involving the somatosensory systems, the sympathetic nervous system and the somatomotor system. This conceptual view, that is based on the translation of experimentation on animal models and on patients with CRPS as experimental human model into clinical reality, will much better explain the clinical phenomenology of CRPS and will lead to a better formulation of hypotheses that can be tested experimentally. Our scientific view to explain CRPS mechanistically may serve as a model to explore other generalized chronic pain diseases such as irritable bowel syndrome, fibromyalgia, chronic fatigue syndrome, non-ulcer dyspepsia, tension-type headache, chronic pelvic pain, chronic low back pain and the like. Sandrini, G., Friberg, L., Coppola, G., Jänig, W., Jensen, R., Kruit, M., Rossi, P., Russell, D., Sanchez del Rìo, M., Sand, T., Schoenen, J. Neurophysiological tests and neuroimaging procedures in non-acute headache (2nd edition). Eur J Neurol 18, 273-381 (2011). Sandrini, G., Friberg, L., Coppola, G., Jänig, W., Jensen, R., Kruit, M., Rossi, P., Russell, D., Sanchez del Rìo, M., Sand, T., Schoenen, J. Neurophysiological tests and neuroimaging procedures in non-acute headache (2nd edition). In: Gilhus, N.E., Barnes, M., Brainin, M. (eds.) European Handbook of Neurological Management: Volume 1 Second Edition. Wiley-Blackwell Oxford Chichester UK, pp. 53-62 (2011).